Having entrance door, security entry phone, stripped oak flooring, central heating radiator, two double glazed windows to the side with curtains and also access to the well insulated loft space via in-built retractable stair ladder offering additional storage. Having two double-glazed windows to the front, wall mounted gasfire and central heating radiator. Good quality fitted carpet, curtains. Fully fitted with arrange of modern white gloss wall and base units with chrome handles providing ample storage with beech work top surfaces above. 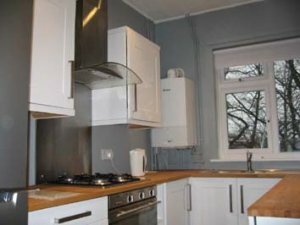 Stainless steel bowl and a half sink unit and drainer, electric double oven, gas hob, cooker hood and integrated dishwasher. Plumbing for automatic washing machine. Inset spot lighting and tiled floor. Fitted roller blind. Having double glazed window to the rear and central heating radiator. Good quality fitted carpet, curtains. Fitted with a beige/cream suite comprising panelled bath with electric shower over, hand washbasin, lowflush wc, extractor fan and central heating radiator. Mirrored bathroom cabinet and additional bathroom fittings. Tiled floor and partially tiled walls. The property has a single garage and additional separate external storage space and stands in well tended and stocked communal gardens. Ample additional parking is available within the grounds.